Positron emission tomography (PET) is a functional nuclear medicine imaging modality based upon the detection of energy emitted when a positron produced by decay of a radioactive tracer is annihilated in a collision with an electron. This energy is emitted in the form of two gamma rays emitted at 180o to each other with an energy of 511 keV. 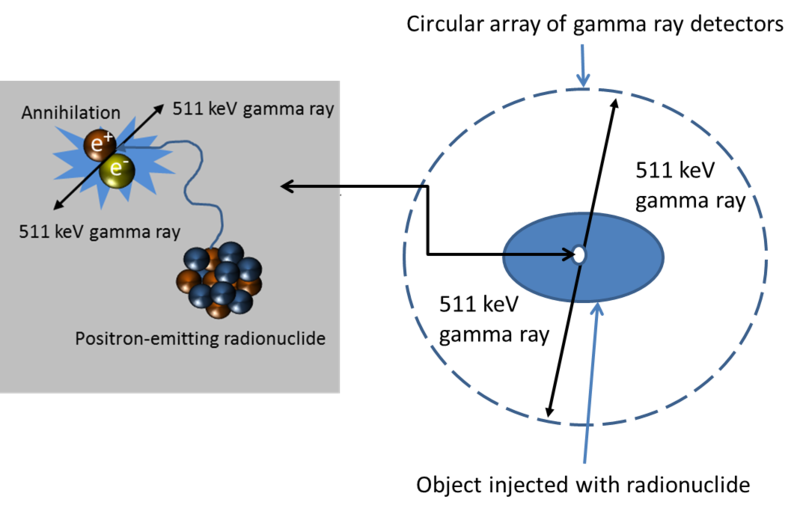 The gamma rays are detected with a dedicated PET camera system comprised of a ring of detectors (Figure 1). The ring design exploits the fact that that two photons detected in close temporal proximity by detectors separated by 180o in the ring are likely to have originated from a single annihilation event in the sample somewhere along a line between the two detectors. This simultaneous detection is termed a “coincidence” event. All of the coincidence events detected during an imaging period are recorded and the raw data is reconstructed to produce cross-sectional images. Some positron emitters and their half lives are given in Table 1. It is clear from Table 1 that isotopes that decay be positron emission are typically very short lived, meaning that efficicient operation of PET imaging facility requires local production of isotopes. Isotopes for the Small Animal And Materials Imaging Core Facility are produced at the Winnipeg Cyclotron Facility on the Health Sciences Centre campus. Table 2. Physiologically useful PET tracers. PET isotopes incorporated into ligands for clinically important cellular receptors can be used to determine the distribution and density of such receptors, as well as to assess the affinity of ligands for receptors For example 18F labelled L-Dopa can be used to localise dopaminergic receptors. In addition to diagnosis, PET imaging can therefore also be used to study the efficacy and pharmacokinetics of therapeutics.